Grassroots Volunteering has grown a lot since 2011, and by and large it’s thanks to the generous volunteers mapping the world of social enterprises and worthy volunteer projects. GV’s founder, Shannon O’Donnell, uses the topic of international volunteering as a way to enter the conversation about how we can all affect more responsible and connected vacations. GV’s founder works to promote ethical, responsible travel around the world both through this site, Grassroots Volunteering, as well as her critically acclaimed book, The Volunteer Traveler’s Handbook. She also speaks at universities about the U.S. about ethical and responsible travel — if you’re keen to book her as a speaker, head over here. 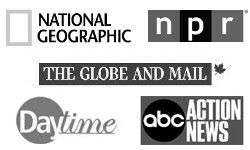 Below are the highlights from the news outlets and organizations that have featured GV over the years. Daytime TV show (video, article). We’d love to chat with you elsewhere on the web. Consider joining the GV family through any of our social media and newsletter links below. Once you join, why not leave a comment and let us know why you value responsible tourism as well.